Dave’s go the sniffles. He looks like he’d rather be tucked up in bed with a good woman. But, he’s a loyal determined member of the Greenwich Curry Club and he’s battled through the snow and the cold to be here tonight. He missed the early beer at the Prince Albert but we (Ian and myself) have forgiven him because of his cold. Sniffle, sniffle. Even with an intimate meeting of just three curry lovers we decide no Indian can be complete without a Chicken Tikka Masala (Britain’s favourite dish) so the Makhani Murgh (£7.70) the orginal version of this dish, is instantly ordered with Pilau rice (£2.95) and a naan (£2.20). That should help your sniffles Dave. But tandoori is the speciality here at the Mogul, so two Tandoori Sizzlers (£9.90 each) are ordered (it had all been decided in the pre-drink meeting in the pub). We know we can pinch a bit of the creamy Makhani anyway. The Murgh Makhani is spot on (yes we do pinch a bit of it), and little metal dish holding the rice does look sweet in front of Dave. He pushes it into the middle of the table. The Sizzler includes good chunks of chicken and lamb as well as pieces of sheekh kebab. All delicious with mint sauce, and none of it glowing with red colouring. Dave might have the sniffles but he’s valiantly battling on with his Kingfisher between mouthfuls. Ian is on the red wine, but he’s a nice bloke so we let him off. Our waiter is determined to sell us some more rice/bread/vegetables and returns umpteen times just to make sure we haven’t changed our mind since our initial order. We hold firm and enjoy the Murgh Makhani and Sizzlers. 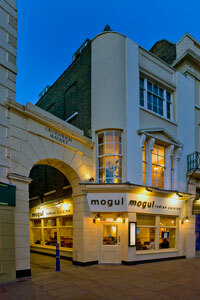 • Mogul, 10 Greenwich Church Street, SE10 9BJ. Tel: 020 8858-6790. Open: Mon-Fri 12.00-14.30, 18.00-23.30, Sat-Sun 12.00-23.30.